I've written about redsea, my RDS decoder project, many times before. It has changed a lot lately; it even has a version number, 0.7.6 as of this writing. What follows is a summary of its current state and possible future developments. Redsea can decode several types of data streams. The command-line switches to activate these can be found in the readme. Its main use, perhaps, is to demodulate an FM multiplex carrier, as received using a cheap rtl-sdr radio dongle and demodulated using rtl_fm. 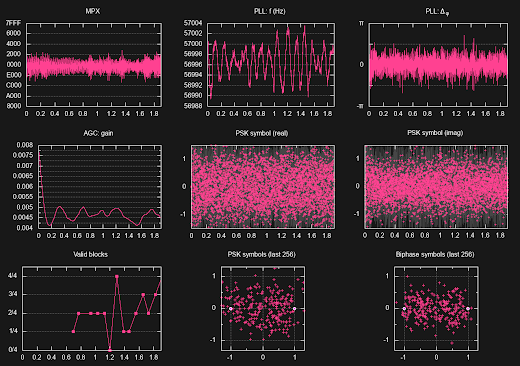 The multiplex is an FM demodulated signal sampled at 171 kHz, a convenient multiple of the RDS data rate (1187.5 bps) and the subcarrier frequency (57 kHz). There's a convenience shell script that starts both redsea and the rtl_fm receiver. For example, ./rtl-rx.sh -f 88.0M would start reception on 88.0 MHz. > ./rtl-rx.sh -f 87.9M | grep "\"radiotext\"" | jq ".radiotext"
The output can be timestamped using the ts utility from moreutils. Additionally, redsea can output hex-endoded groups, the same format mentioned above. I've made an effort to make redsea fast and lightweight, so that it could be run real-time on cheap single-board computers like the Raspberry Pi 1. I rewrote it in C++ and chose liquid-dsp as the DSP library, which seems to work very well for the purpose. Redsea now uses around 40% CPU on the Pi 1. Enough cycles will be left for the FM receiver, rtl_fm, which has a similar CPU demand. On my laptop, redsea has negligible CPU usage (0.9% of a single core). Redsea only runs a single thread and takes up 1500 kilobytes of memory. I've gotten several reports that redsea requires a stronger signal than other RDS decoders. This has been improved in recent versions, but I think it still has problems with even many local stations. The noise floor around the RDS subcarrier is roughly 23 dB higher in the noisy signal. Redsea recovers 99.9 % of transmitted blocks from the good signal and 60.1 % from the noisy one. Below, redsea locks onto our good-quality signal. Time is in seconds. There's some jitter in the 57 kHz PLL, especially pronounced when the signal is noisy. 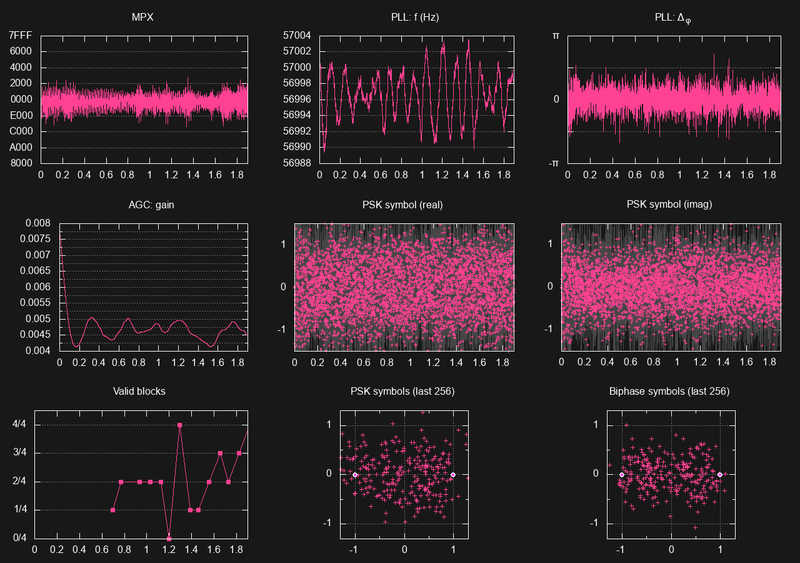 One would expect a PLL to slowly converge on a frequency, but instead it just fluctuates around it. 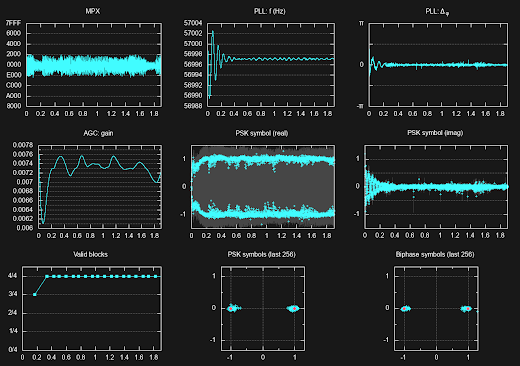 The PLL is from the liquid-dsp library (internal PLL of the NCO object). What could affect this? Loop filter bandwidth? What about the gain, i.e. the multiplier applied to the phase error? Is liquid's symbol synchronizer being used correctly? What should be the correct values for bandwidth, delay, excess bandwidth factor? Do we really need a separate PLL and symbol synchronizer? Couldn't they be combined somehow? Afterall, the PLL already gives us a multiple of the symbol speed (57,000 / 48 = 1187.5). The PLL could potentially be made to lock onto the pilot tone instead. It would yield a much higher SNR. According to the specs, the RDS subcarrier is phase-locked to the pilot, but can we trust this? Also, the phase difference is not defined in the standard. What about mono stations with no pilot tone? See redsea wiki for discussion. Are the parameters for rtl_fm (gain, filter) optimal? Is the bandwidth (171 kHz) right? Besides the basic RDS features (program service name, radiotext, etc.) redsea can decode some Open Data applications as well. It receives traffic messages from the TMC service and prints them in English. These are partially encrypted in some areas. It can also decode RadioText+, a service used in some parts of Germany to transmit such information as artist/title tags, studio hotline numbers and web links. If there's an interesting service in your area you'd like redsea to support, please tell me! I've heard eRT (Enhanced RadioText) being in use somewhere in the world, and RASANT is used to send DGPS corrections in Germany, but I haven't seen any good data on those. A minute or two of example data would be helpful; you can get hex output by adding the -x switch to the redsea command in rtl-rx.sh. That's a shame. I saw 11A groups with no ODA allocation, so I thought it could be RASANT. Most important thing (about RDS) here are the location codes, which encode lots of locations, streets, exits and interchanges in a 16bit value. These are the "heart" of the messages. And only these codes are "encrypted" in TMCpro. That's explained in ISO 14819-6. And it's very mundane and based on a fixed code table which is built into TMCpro devices. Basically, the 16bit values are rotated and then XOR'd with a specific value. In the TMC data stream there's a flag that announces the encryption (Otherwise non-TMCpro devices would try to use the encrypted locations.) and tells the device which key should be used from the table. I ran a small attack against that and found one entry of that table (which was used by my local TMCpro station). This didn't change over a loooong time so I'm not sure if that ever changes at all. I wish RT+ was used in Finland as well! Can't remember if I clicked submit yesterday. Apologies for duplicates. Anyhow, thank you so much for this. Im looking to build Radio into KODI for a Car Computer. Would be nice to get station information in DBus so that this can just sit nicely on the backend minding its own business. Anyhow, my curiosity is how car radio's work with scanning frequencies while listening to the radio. I presume with the RTL-SDR dongles, you can't tune into a station, while scanning the rest of the frequencies for RDS signals for Traffic, News etc... I presume I would need two RTL-SDR dongles? To scan other stations in the background you would indeed need another RTL-SDR. For this reason some stations transmit so-called "enhanced other networks information" (EON), which is supported by redsea. It contains information about program types and traffic messages on other stations of the same network - usually this means stations owned by the same broadcaster. Now we know there's another station in this network at 94.0 MHz with PI code 6203, and audible traffic information can be expected there ("tp":true). When a traffic message is currently running on that frequency, this will be signified by both "tp" and "ta" being true. The other_network field may also contain the station name ("ps") and current program type ("prog_type"), whether it's news, pop music or something else. In order to use RDSSpy in realtime with netcat in the windows fork I've added G: to the hex string. Maybe it's worth to add a new option for this purpose. 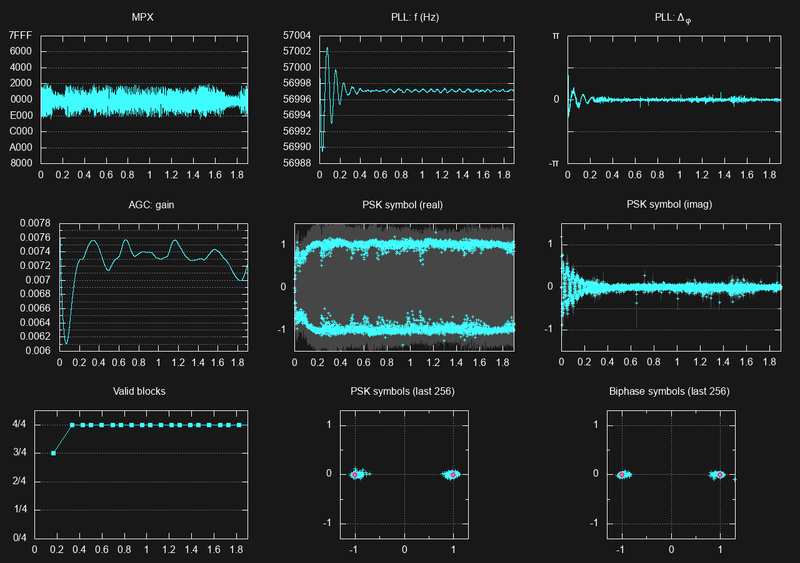 I have enjoyed your blog for many years and finally got around to writing my own SDR code. I managed to write a stereo FM transmitter using the Analog Devices Pluto as the transmitter. I am having trouble getting RDS working, currently I hand wrote the 416 bits required for a B0 Station Name message and redsea successfully decodes it in -b mode. However when I integrate the code into the rest of the FM transmitter I get nothing when receiving the RF on an RTL-SDR. 1. How sensitive is redsea to the pilot tone being exactly at 19 kHz and the RBDS carrier at 57 kHz? 2. How sensitive is redsea to the bitrate being exactly 1187.5 bit/s? I don't think those are causing the issues that I have, but I wanted to rule them out. Any debugging suggestions would be great. If I can find good reference waveforms with the binary data, the diff_encoded_data, the impulses and finally the baseband RBDS signal that would be great, but I haven't found a source. Hi, redsea ignores the pilot tone so it makes no assumptions about it. As for the 57k and 1187.5, there is a PLL that takes care of any error between expected and received symbol rates. I'm not sure how much error this synchronization allows however. Are you able to receive the RDS in any other RDS receiver (maybe a physical FM radio)? SDR# on Windows won't receive it either. At the moment I don't know how to test my implementation of the processing from binary bit-stream to baseband RF.